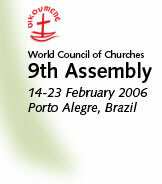 The World Council of Churches 9th Assembly came to an official end Thursday with closing prayers. Assembly participants gathered one last time under the giant worship tent at the east end of the campus. Rev. Robina Marie Winbush of the Presbyterian Church (USA) delivered the sermon, titled "For the healing of the nations," taken from Rev. 22:1-5. She used river imagery from the scriptures and from a poem by Langston Hughes to speak of God's nourishing river of life. The trees growing alongside that river, she said, produce "healing leaves." She cited examples of healing brought about by individuals around the world. "Would you consider with me the possibility that God has been whispering to our spirits throughout this Assembly, 'I am transforming the world?' " she said. 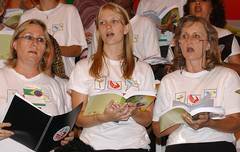 The service again featured a variety of rich music, prayers, and scripture. It also included a prayer of commitment for the newly elected central committee.